We’re back for 2017. It’s been sometime since there has been activity on this page and we are rearing to go! Thank you for all of those who have and continue to support us. We look forward to bringing you content from and inspired by the Caribbean region. Some exciting highlights for this year include a Song and Dance Cabaret Fundraiser in NYC as well as a paired theatrical event featuring a new play, “Sign Language and Swahili” as well as “The Migrants of Midnight” We will also be launching several poetry series: The Grapevine Series, The Standpipe Series and the Pipeline Series. Check out MA’s Playhouse for details. If you would like to become a contributor through your time, content or membership please feel free to contact us at masplayhouse@gmail.com. We are currently looking for additional contributors for the Grapevine and Standpipe series. We are also searching for island ambassadors to report on island specific cultural events of the theatrical and artistic bent. If you have any questions please feel free to email us. “Home” is a 10 min play that explores the connection, or lack thereof, of a young Haitian man to his Haitian roots and his journey home. This piece is will premiere on the same night of the world premiere of “Home Sweet Home”, the documentary that sparked the creation of this play. The night will explore the nostalgia associated with making the journey from the Caribbean and settling in the US. Male- 40’s or 50’s Haitian or very good Haitian accent a must. Female- 40’s or 50’s Haitian or very good Haitian accent a must. Interview by appointment- send headshot and resume asap to masplayhouse@gmail.com. Company: Ma’s Playhouse’s goal is to provide the Caribbean-American Actor and/or Playwright with a space and a voice that helps them to extensively explore and celebrate this duality through workshopping and full scale productions of new and old works, and to furthermore encourage intercultural understanding through an amalgamation of ideas, sharing of spaces and the production of culturally and emotionally driven works. For more info go to www.masplayhouse.com, www.masplayhouse.com/blog or join us on www.facebookcom/masplayhouse. MA’s Playhouse Theatre thanks all participating playwright/poets whom attending our past meetup on 9/21/13. For all other meetup activities, please join us on meetup.com at MA’s Player! Sunjata: A very relatable and interesting character. He is a former mercenary in search of inner peace, but continue to fall into deep conflict against the martial art powers of the Centra-unit. Lynch Blackmyn: An an ex marine that was hired by an elite organization to establish and manage a high power military component called the Centra-unit and use it to hunt Sunjata. 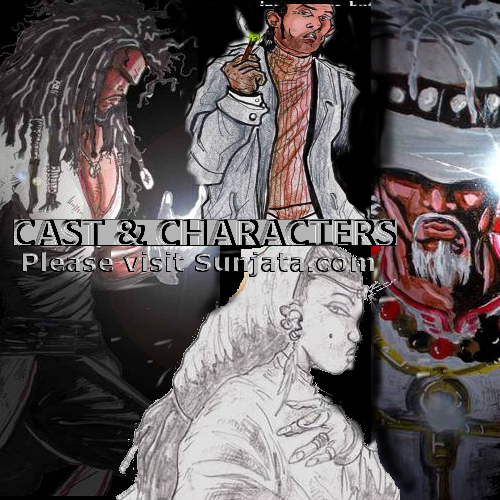 Baba Ujad Heru: Is Sunjata adopted father and the Locked source’s genetic father. He was once a member of the Lambanni Tribe Nine and studied the ancient art of the Totem stance, which consists of Simba Claw, Urete Strike, and the force of Sebek. Sunjata Book One: The Blood Wars is available now via Amazon, Barnes and Nobel, and Author House. “All Sunjata wanted was to find information leading to the mysteries of his past, while leaving the brutal life as a mercenary behind him, forever. But when a series of events lead the government to believe that he is the prime suspect to the celebrity serial killings, he is forced to return to his old ways of martial arts combat. A gung-ho ex-marine named Lynch Blackmyn is called in to hunt him down using his high-tech military squadron; the Centra-unit. Sunjata later discovers that a mysterious secret society called the Mystici is also on his tail for reasons unknown. After many narrow escapes and run-ins with both old and new acquaintances, Sunjata’s past resurfaces and sparks the Second Blood War. The harder Sunjata tries to lead a peaceful life, free of violence, the more difficult it becomes for him to avoid deadly conflict. “Have fun and live life. As Sunjata would say, “Be Blessed and Manifest…”Feel free to contact me at www.sunjatasaga.com or sunjata22@yahoo.com. Thank you to all the families that came out on Sunday August 4th to participate in the continuing efforts of MA’s Playhouse Folklore workshop. Upcoming plays, events and other attractions can be found on our website. Looking back is always a bit hazy, but no matter what struggles or joys lay in our past we often look on them fondly knowing that they have helped shape who we are today. Taking a look back on this production, an overwhelming sense of gratitude fills me. Working with actors from beginning to end was an invaluable experience. This piece was a collaborative effort on the part of several playwrights including myself and so it was something that was near and dear to my heart. The rehearsal process was both fun and fascinating. Though rocky at times some of the most beautiful moments happened during those rehearsals and it was here that another transformation of these pieces occurred. Finally, the day of the performance arrived and it was time to debut the work and the workers before an audience. I can truly say that it was much more than I could have hoped for. The pieces took on a life of their own before the audience and it was apparent that the material resonated with many of them. The actors had done their job and had once more transformed the work and themselves. Though it was a short run it was a successful one and I am grateful to the cast and crew on a very personal level for breathing life into NOSTALGIA: Memories of a Tropical Past. Check out the actor’s thoughts video on NOSTALGIA: Memories of a Tropical Past.